Once the geometry was correct, we turned our attention to the springs, again relying on OE methods, which in the case of springs means frequency tuning. Frequency-tuned coil springs share harmonious oscillation characteristics that allow them to work as a matched set, front and rear. The benefit is that they help to keep the JK balanced and in contact with the road, even when driven at high speed over rough surfaces. Expedition-Ready / Daily-Driven Practical. More so than any of its predecessors, the JK Wrangler is not just a trail-mastering off-road specialist, it’s a truly “street able” on-road transport too. 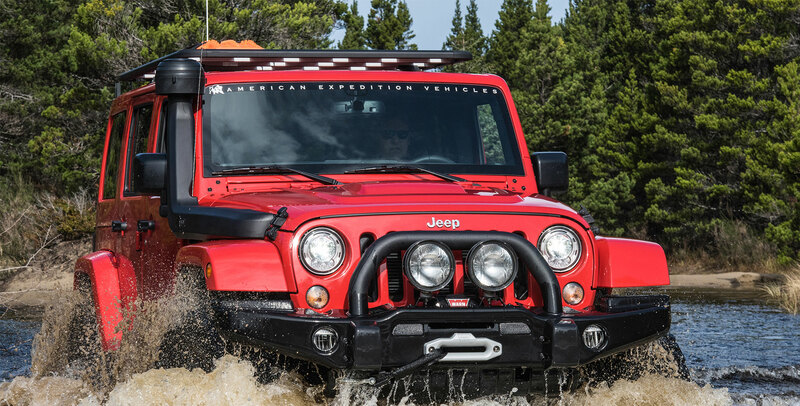 The AEV DualSport enhances the JK to raise its performance in both arenas. Tuned Vehicle Dynamics. The DualSport system has been thoroughly tuned for impeccable behavior in every situation you might put it in – and especially the ones you didn’t intend to. Please note: The AEV/Bilstein 5100 series shock absorbers included in this kit feature a Bilstein Triple C zinc plated finish. This finish must be serviced regularly in order to maintain its luster. Particularly in moist climates, a protective coating, such as wax or lubricating oil should be applied to prevent tarnishing. The finish is not covered under warranty. 35 x 12.50 0-200 lbs. 35 x 12.50 0-300 lbs. 35 x 12.50 0-250 lbs. 35 x 12.50 0-400 lbs. 37 x 12.50 0-400 lbs. 37 x 12.50 400+ lbs. When I install an AEV Suspension, will I get the actual lift height that AEV advertises? AEV cannot guarantee that the lift height you get will exactly match the height we advertise. This is simply due to the fact that AEV designed its suspensions to carry the weight of additional accessories and loads, but no two JKs will ever be accessorized or loaded in exactly the same way. Ultimately the weight of your vehicle will influence your final lift height and this could vary by +/- ½-inch or more. There are a lot of suspensions available, what sets yours apart from all the others? In simple terms: OE-style tuning. With the benefit of a former Chrysler suspension engineer on staff, we began by optimizing all of the JK’s control-arm, track-arm and steering geometry to accommodate a lifted ride height. We then proceeded to develop custom coil springs and custom-tuned shocks. All of this development followed factory engineering methodology. The overall goal was to not only build a lift, but to create a fully tuned suspension that would enable a lifted JK to outperform a stock one in all driving environments. We think we succeeded as AEV-equipped JKs not only have more wheel travel than stock ones, but can out corner them as well – and all without compromise to safety, practicality or comfort. In the 4WD suspension aftermarket this is truly a high water mark given that for decades the focus has primarily been on looks and wheel travel. The contents of your 3.5-inch and 4.5” DualSport Suspension Systems are very different from the other kits I’ve looked at – why? AEV chose not to let traditional suspension norms drive the content of its JK DualSport kits. A good example of this would be control-arms. On the older Jeep TJ the arms were weak and short. So it was desirable to replace them with something stronger and often longer. But with the JK, the factory control arms are plenty strong right out of the box. They are also substantially longer, which improves geometry. And finally, they come with very high-quality rubber bushings which outperform the typical aftermarket urethane units in just about every meaningful way. So you won’t see custom control arms in AEV’s DualSport Suspension Systems. What you get instead is a tour-de-force in engineering and attention to unusual details. For example, AEV includes its ProCal Module which lets you recalibrate your JK after you’ve installed larger tires and changed the axle gears. What is “Frequency Tuning” and what are its benefits? The Jeep JK has two spring masses: the front axle and the rear axle. It is essential that these two masses work in harmony with one another when they are disturbed by bumps in the road. To illustrate this, when the JK is driven quickly over something such as a speed bump, the front spring mass (axle) is disrupted and it responds by compressing, extending and eventually settling. If the vehicle is traveling fast enough, the tail will hit the same bump before the front has settled. The objective in Frequency Tuning is to get the rear spring mass to equalize with the front as rapidly as possible after the rear has been disrupted. When this is done correctly the vehicle remains manageable and it exhibits none of the tail bouncing and fishtailing many drivers have experienced with other suspensions. To make this happen in AEV’s DualSport Suspension Systems, AEV began at the front of the JK where we conducted bounce testing. In this test, coils of various spring rates were installed on a shock-less JK and bounced under the load of the nose of the vehicle. Following OE formulas, the goal was to find the spring rate that delivered the known ideal number of oscillations (bounces) per minute. With this complete, attention was turned toward the rear of the JK. To find the spring rate that delivered the ideal number of oscillations there, OE formulas were again followed. But rather than also utilizing bounce testing, the rear spring rate was achieved strictly through mathematics. This formula took into consideration the front spring oscillation rate, the JK’s wheelbase, weight and speed of travel. With harmonious oscillation rates fore and aft, AEV is able to get the tail of DualSport-equipped JKs to settle within approximately 1.5 oscillations of the front. The shocks that come with the systems look like ordinary Bilstein 5100’s, are they? Yes and no. The shocks are exclusively made for AEV by Bilstein and carry their own unique part numbers. Their basic construction is in fact identical to the 5100, though they are specifically sized to AEV’s specs to fit our JK suspension. This is good news because Bilstein arguably makes the best all-around shocks available. But these shocks are special in other ways too. This is because they contain valving that was specifically tuned for our suspension by a joint effort of AEV and Bilstein engineers. The final tuning was the result of many hours of ride and handling test iterations which were performed on Chrysler’s own proving grounds. This is in contrast to the shocks and tuning of many other aftermarket suspensions where a middle-of-the road approach is often taken. This is done simply to avoid the outlay of time and expense required to properly test for, and develop, proper tuning. Think of AEV’s approach like a well-tailored suit versus an off-the-shelf version. Does the great handling AEV’s DualSport Suspension Systems provide mean that you have stiff springs that don’t flex well? Not at all. It’s important to point out that our great handling comes from more than just the springs. Our unique suspension geometry is just as important and so are the shocks, so it’s really the total package that delivers handling, which doesn’t require that the springs be stiff. I do a lot of backcountry adventuring that sees my JK heavily loaded, but I also daily-drive it. Will your suspension sag when loaded or beat me up when empty? No, that was a critical requirement in our design process. We know that many of our customers will use their JK’s for significant off road and overland trips, but the reality is that most of the vehicle’s miles will be racked up on the freeway. It wasn’t acceptable for us to produce a suspension that performed beautifully off road, but that was either uncomfortable or unsafe in on-road driving conditions. The first key is that our frequency tuned springs are also progressive rate both front and rear – so they get stiffer as the loads increase. This helps keep the frequencies closer to constant, generating consistent ride and handling across a wide range of loads and speeds. But to truly make our suspension ‘dual sport’ for your type of use, our proprietary shock tuning was developed specifically to match our unique springs, further enhancing the ride vs. load balance. This is another place where traditional expectations are based on the fact that most of the suspensions available in the aftermarket rarely accomplish the feat of adding capability without compromising ride and handling. It’s a shame to throw away all of the original factory tuning of the stock vehicle for the sake of adding some increased off-road ability, but that’s what normally happens. The nice reality is that capability can be added without compromise, it just takes some additional knowledge and investment in testing, development and higher-grade components. The Premium systems add the High Steer Kit – what does the High Steer Kit do? AEV's High Steer Kit provides significant improvements to steering precision and handling by correcting the roll center height of the front suspension. Bringing the steering geometry back into factory alignment reduces body roll, bump steer, and roll steer, all major contributors to the loose or sloppy steering and driver fatigue commonly associated with many lift kits. the kit includes a flipped draglink to improve ground clearance as well as a heavy duty steering damper. AEV's High Steer Kit is included with our 3.5"-4.5" DualSport SC and RS suspensions, but can also be added on to suspensions in the 3.0"-4.5" range from other manufacturers. Minimum of 3.0" of jounce bump spacing is required. Can the AEV High Steer Kit be installed with another company’s suspension? Will I get the same improvement to steering and handling? Yes, the AEV High Steer Kit is available for ala-carte purchase and can be added to most other manufacturers’ suspension kits to improve the steering performance. We have spoken to many customers who did just that and were pleased with the improvements that it made. That said, we weren’t able to test our High Steer Kit with every single suspension available and AEV’s High Steer kit is lift-height-sensitive. If you have specific questions about your suspension, feel free to call. Your rear track bar tower is taller than all the others I’ve seen and even comes with a new track bar – why? This is because ideal suspension geometry is not something to deliberately stop short of when your goal is the best possible handling. AEV’s tower is as tall as it is to put the rear suspension’s roll center where we wanted it, and that happened to be high enough that it necessitated a new track-bar shaped to clear the exhaust. This is a prime example of letting the suspension’s design philosophy and performance objectives drive the content, even when that leads to a more expensive solution. Why doesn’t AEV offer a long-arm system for the JK? The first reason is that there is no significant benefit to adding long arms to a JK that is lifted in the 3.5 to 4.5-inch range. The second and perhaps more important reason is that the location of the fuel tank prevents having both good geometry and good ground clearance in a single long-arm design. If you’re going to spend more than twice the money for such a makeover, wouldn’t you want both? Since the JK’s stock arms are much longer and stronger than the TJ’s were, there is plenty of potential available without the tear up and expense of long arms. When you also consider the larger size and other aspects of the JK that make it more suited for ‘overlanding’ than rock-crawling, the best value for a JK (for the way most enthusiasts will use it) is a well-tuned short arm system. So that’s what we focused on. Why don’t you supply new/adjustable track bars in with your DualSport Suspension Systems? As with the control arms, the number one reason is because the original parts are perfectly fine and nothing about lifting the JK dictates that they need to be replaced. But there’s more: we feel that track bars are so critical that they represent a greater safety concern from failures than any other item (control arms, shocks, etc.) in most suspension designs. This is why we have chosen to retain the OE forged components. Why do you use brake hose drop brackets instead of longer braided stainless hoses? As with so many of the original chassis components, our philosophy is akin to “if it ain’t broke don’t fix it”. In this case, the stock hoses are rigorously tested and built to endure everything you could ever expect of them – they just happen to not be long enough for a taller vehicle. Since mild reshaping of the hard lines is enough to allow additional length to accommodate longer shocks, going with the solution that saves cost and installation time (no need to bleed brakes) is the logical option. It should also be noted that with aftermarket hoses you still have to find more length in the ABS wires to match them. Do I need to change my drive shafts to use your kit? On all pre-2012 JKs equipped with automatic transmissions, you will need to replace your front driveshaft with a narrower unit. On all pre-2012 JKs equipped with manual transmissions, you will not need to replace your front driveshaft. On all 2012+ JKs equipped with automatic or manual transmissions, you will not need to replace your front driveshaft. What parts are different between a 3.5” and 4.5” DualSport Suspension Systems? Can I upgrade easily? Between the 3.5” and 4.5” DualSport Suspension Systems, the only differences are the springs, the bump-stops, and the additional shock extension brackets. All other parts were designed to configure properly for either lift height. These are the only components that would need to be upgraded, and all can be purchased as an upgrade kit from AEV. Beyond this, it should be noted that AEV does not offer an ST version (ie. no High Steer Kit) of the 4.5” DualSport Suspension System. We determined that at that lift height, the High Steer Kit is needed in order to get an acceptable level of handling. So if you are starting with a 3.5” DualSport ST kit, you’ll also need to add a High Steer Kit. What size tires can I run with each kit (3.5” and 4.5”)? This is always a tricky question because there are so many factors involved such as wheel width and offset, body/fender modifications, spring rates and bumpstop spacing, etc. The short and simplified answer is that if running our wheels (or dimensionally equivalent), we recommend a 35x12.50 tire with our 3.5" kit, and a 37x12.50 tire with our 4.5" kit. That said, each kit can accommodate larger tires and it becomes a personal decision based on how the vehicle will be used and whether you’re willing to put up with any tire rubbing. Can I use a drop pitman arm with your DualSport Suspension System for better steering? How will your DualSport Suspension Systems handle towing a trailer? Every bit as well as the JK does in stock form, and to be honest – probably better. While we made sure the suspension would not detract from the factory tow ratings, the many unique things we did for handling also happen to positively impact stability for towing. Both our progressive spring rates and our significant geometry corrections contribute to minimize sway and instability. So you should be able to safely tow anything – under any conditions – that are within the factory parameters. Why is AEV’s ProCal Module included with the DualSport SC and RS Suspension Systems? The Jeep JK is a computer-controlled vehicle. For an aftermarket suspension to truly integrate with this vehicle’s computer, more is required than just good geometry, springs and shocks. While these components can be engineered to maintain factory parameters for things like body roll, they do nothing to correct for larger tires sizes – which tend to go hand-in-hand with a suspension lift. It is important to remember that the JK’s computer is designed to simultaneously monitor vehicle pitch and roll, vehicle speed, wheel speed, steering input and more. So what happens if the vehicle’s computer isn’t fed accurate information? The ESP system activates to correct for what it perceives as problems, even when problems may not actually exist. A good example of this is in regard to vehicle speed. As mentioned above, larger tires and lifted suspensions go hand-in-hand. Unfortunately as soon as the larger tires are installed, inaccurate information about vehicle speed is immediately sent to the computer. 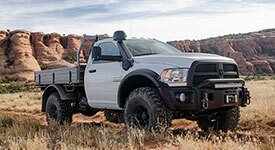 AEV knew this would create ESP problems so the ProCal Module was included with its line of DualSport Suspension Systems. This tool allows for easy speedometer recalibration – which means correct information is being fed to the computer. It should also be mentioned that the ProCal Module provides a wide range of other recalibrations for the JK. These include axle gearing changes, tire pressure monitoring changes, daytime running lamp changes, high-idle options for winching and much more. What do the Dualsport Suspension System’s Drop Brackets do? The first and most obvious thing that AEV’s Drop Brackets do is improve the approach angle of the front control-arms. If you look at a stock JK you will notice that the front control arms are nearly level with the ground. This is an optimal situation because when the front axle/suspension encounters a bump, the control-arms do not interfere with free upward movement. However, if the control-arms are steeply angled, as they often are on lifted Jeeps, they begin to interfere with upward movement. This is because the front axle/suspension must now move forward as it moves upward. This creates conflict and it reduces ride quality and handling. The Drop Brackets eliminate this by restoring near-factory positioning for the front control-arms. The second and far less obvious thing that AEV’s Drop Brackets do is reposition the front axle’s instant center. If you look at a stock JK you will notice that it has upper and lower front control arms. If you look very closely you will notice that the upper control-arms angle slightly downward toward the lower ones as they run fore to after along the vehicle. If both upper and lower control-arms were allowed to continue on out past the tail of the JK, they would eventually intersect. This intersection is called an instant center and it is the imaginary point around which the front axle pivots. In stock form this instant center is out behind the JK, but AEV brings that instant center closer in toward the middle by increasing the downward angle on the front upper control-arms. By doing this, AEV is able to play with physics and reduce nosedive when the JK’s brakes are applied. In test drives, AEV employees will virtually lock up the brakes for customers so they can witness the minimal nosedive taking place. We don’t encourage our customers to do the same thing, but if you ever have to stop fast, you’ll feel more in control and you’ll feel less sensation of being jettisoned from your seat. Can I use my stock wheels with AEV’s DualSport Suspension Systems? The factory wheels will not have the correct offset to allow you to use them with our 3.5/4.5 DualSport Suspensions. Aftermarket wheels are recommended both for adequate width to mount larger tires and decreased backspacing for chassis and steering clearance. Any AEV JK Wheel will solve the clearance issue, or set of 1.0" thick wheel spacers with the factory 17" or 18" wheels. Why would I choose AEV’s Remote Reservoir shocks over the non-Remote Reservoir units? In terms of day-to-day driving performance, you would notice virtually no difference between a non-remote reservoir shock and a remote reservoir shock. Even for moderate off-roading and rock-crawling the difference would be negligible. Where a remote reservoir shock begins to earn its keep is when the roads turn rough, the speeds climb and these conditions are maintained over great distances. Hours of moderately fast to very fast driving on rough roads can send shock temperatures into the stratosphere. At this point the shock’s oil can begin to foam causing the shock to go soft. This condition dramatically reduces the shock’s ability to dampen movement and the vehicle can become difficult to control unless speeds are drastically reduced. The remote reservoir shock contains a greater volume of oil. This increases it capacity to handle the heat that develops in these conditions – consequently foaming is less likely to occur. If you drive in these kinds of conditions remote reservoir shocks will make a lot of sense. If not, the non-remote reservoir shocks are the obvious way to go. Do I need to make exhaust modifications to install AEV’s DualSport Suspension Systems? On 2012+ JKs, exhaust modifications are now necessary. The point of interference is where the exhaust crosses below the front driveshaft. Customers should anticipate using an exhaust shop to create the necessary modification, which will be as simple as welding in a mildly ‘u-shaped’ section of tube just below the driveshaft. Where are AEV’s DualSport Suspension Systems manufactured? Nearly all of the components are made right here in the United States. Our Rear Stabilizer End Links are the only components manufactured overseas. We did this because we wanted true OE-style forged tie-rod ends (no heim-joints) which aren’t available in low volumes in the U.S.. In this case, the only way to obtain these high-quality components was by going overseas. We remain committed to American manufacturing, but also want to make sure that we get the right part, and the highest quality part, for our application.